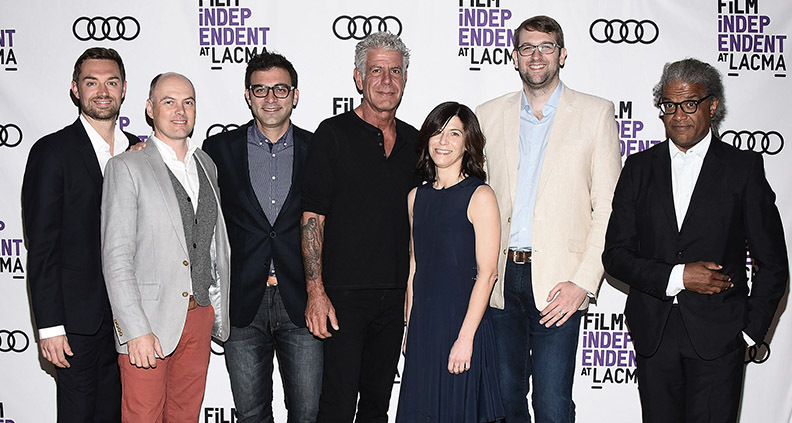 On May 5 Film Independent at LACMA hosted a screening of the season eight finale of the CNN travelogue series Parts Unknown. 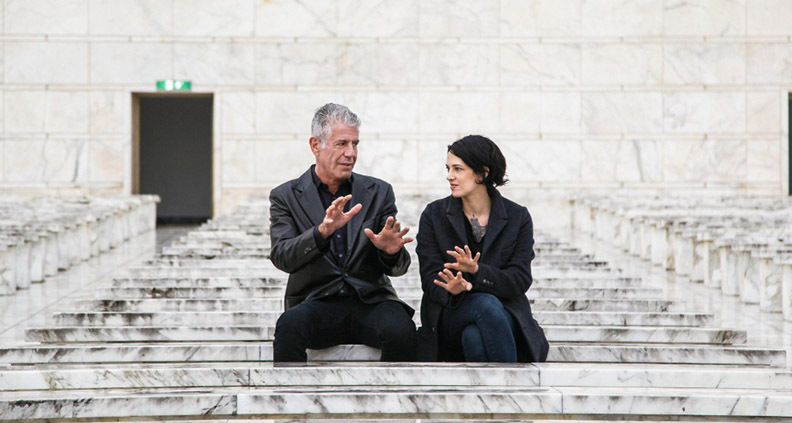 The episode was particularly special, with host Anthony Bourdain seeking to explore and capture the essence of Rome, Italy using a creative new approach to storytelling—one that stepped well outside of the cable show’s traditional production techniques. Following the screening, Film Independent at LACMA curator Elvis Mitchell sat down for a 30-minute conversation with Bourdain (who also wrote the episode), executive producer Sandy Zweig, producer/director Tom Vitale and directors of photography Zach Zamboni, Hunter Gross and Jeff Allen. The episode opens with an acoustic duet sung beautifully in Italian. The music sounds romantic and comforting… until subtitles appear to inform viewers that the song actually concerns a murder. Such is an example of the type of humor and ironic tone the crew wanted to instill in their Rome episode, calling out the episode’s themes of duality and having two sides to a story. Given that the episode was filmed a few months before the 2016 U.S. Presidential election, politics were very much on Bourdain’s mind. This is reflected in the episode as they talk about Mussolini, the ambitions of fascism and how such tumult shaped Rome’s 20th-century landmarks and monuments—a big focus of the episode, along with the mouth-watering footage of homemade pasta and Italian cuisine. To prepare for production, Zamboni said he watched a lot of 1970s and ‘80s anamorphic films in order to understand how that specific style of cinematography captured the feeling he wanted to recreate. Allen said that The Conformist in particular was key piece of inspiration, especially for a set-up at the Palazzo dei Congressi—where shooting was extremely difficult, as the production is more used to shooting in restaurants and tighter spaces, not big open locations. The episode was shot on an Arri Alexa digital camera with anamorphic lenses, with Bourdain & Co. seeking to shoot the Rome episode in a more majestic fashion (but, they said, with more of a Pier Paolo Pasolini influence). The panel commented that shooting on anamorphic is all about dollies, steadicam and tripod. No handheld camerawork. Also, everything in the episode was lit—even though it may not have felt like it to the audience. Rome was a unique for the crew, as they had the intention of making it more “cinematic” than the typical Parts Unknown episode. Luckily, CNN was by the show’s side to support their endeavors. “CNN has been a great partner for us,” Zweig said. “Moving to CNN [from the Travel Channel, where Bourdain hosted the similar No Reservations] felt like it came at exactly the right time. It allowed us to find new challenges, to go to places that the Travel Channel didn’t really have a desire for us to go.” In contrast, the crew said that CNN has done their best to back them up with every crazy idea they’ve had. Bourdain said the crew doesn’t watch other documentaries for inspiration—but they do watch fictional films. He said that what makes it fun for him is imagining cinematic images and capturing them with the help of people capable of making those images a reality, gaining technical satisfaction after everything is put together. The Parts Unknown team takes the idea of not repeating themselves seriously. After doing 100+ episodes, putting oneself in the headspace of creating something different with each episode can be difficult. With no pre-meetings with restaurant owners or scene retakes, they never really know what’s going to happen—and they find joy in filming that way, because it tells a real story. “I think that’s what’s great about the show, things don’t always go according to plan and we get to tell it like it is,” Vitale said. Even the usual host’s summing-up at the end of the typical travel show is something Bourdain hopes he doesn’t have to do. 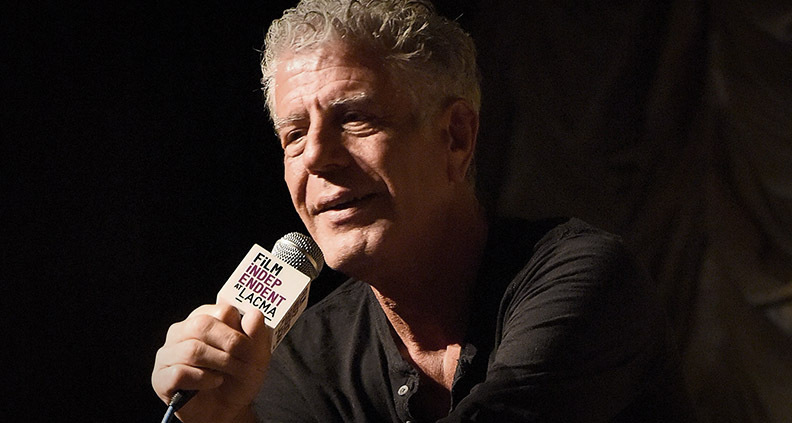 “If we can land on somebody else saying that, let them get the last word and sort of let it hang in the air, that’s a happy moment for all of us,” Bourdain said— another reason why “Rome” feels like such a success and why the team is eager to continue using cinema as inspiration for future episodes. To lean more about upcoming Film Independent at LACMA events, click here. Not a Member of Film Independent yet? Become one today and follow us on Facebook, Twitter and Instagram. And be sure to subscribe to our YouTube channel.